Venice, 1576. Five years after the defeat of the Ottoman Empire at the Battle of Lepanto, a ship steals unnoticed into Venice bearing a deadly cargo. A man, more dead than alive, disembarks and staggers into Piazza San Marco. He brings a gift to Venice from Constantinople. Within days the city is infected with bubonic plague--and the Turkish Sultan has his revenge. But the ship also holds a secret stowaway--Feyra, a young and beautiful harem doctor fleeing a future as the Sultan's concubine. Only her wits and medical knowledge keep her alive as the plague ravages Venice. In despair, the Doge commissions the architect Andrea Palladio to build the greatest church of his career--an offering to God so magnificent that Venice will be saved. But Palladio's life is in danger too, and it will require all the skills of Annibale Cason, the city's finest plague doctor, to keep him alive. What Annibale had not counted on was meeting Feyra, who is now under Palladio's protection--an impossible woman whose medical skills and determination are matched only by his own. 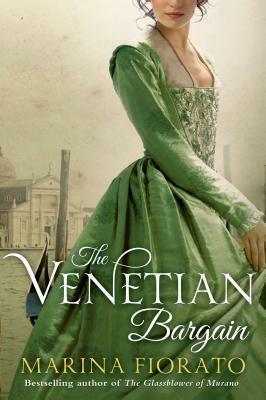 From Marina Fiorato, author of the acclaimed historical novel The Glassblower of Murano, comes a triumphant return to historical Venice with Venetian Bargain. Fiorato's passion for the Italian Renaissance, and Venice in particular, shines in her latest imaginative and colorful tale. The historical details, which will have you believing you are seeing the building of a church and hearing the plague victims' cries, merge with a cross-cultural love story that is touching and relevant to today's reader. "Romantic Times"
Beautifully written....Captivating language, intricate details, and a very dramatic story line combine to entice anyone interested in historical fiction and timeless tales. "Booklist"
Fiorato nimbly weaves cultural, religious, architectural and medical histories into this captivating romance. "Kirkus Reviews""
MARINA FIORATO is half-Venetian and a history graduate of Oxford University and the University of Venice, where she specialized in the study of Shakespeare's plays as an historical source. She has worked as an illustrator, an actress, and a film reviewer, and designed tour visuals for rock bands including U2 and the Rolling Stones. Her historical fiction includes The Daughter of Siena, The Botticelli Secret, and her debut novel, The Glassblower of Murano, which was an international bestseller. She was married on the Grand Canal in Venice, and now lives in London with her family.